With our super bright yellow and green LEDs, this universal visual communication safety system (CSS) adds required safety and visibility to every ride. LED indicators show solid yellow indicating riders approaching, solid green indicating you are the last rider in a group or riding alone, and flashing yellow to signal you or another rider needs assistance. 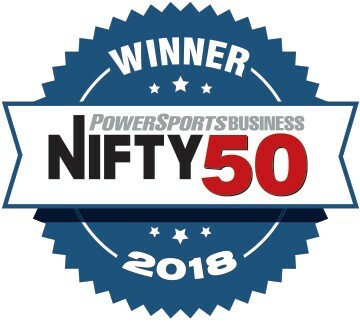 Selected by Power Sports Business as a 2018 Nifty 50 Product! Operated with a three position on/off waterproof toggle switch to select each light setting. Includes standard cradel mount with 3M tape and in-line quick disconnects for easy hook up to any 12VDC or 12VAC power source with included heat shrink terminals. Built in battery backup. Optional RAM® Mount sold separately for mounting to angle surfaces. CA Residents WARNING: This product can expose you to chemicals including lead and lead components , which is known to the State of California to cause cancer, birth defects or other reproductive harm. For more information go to www.P65Warnings.ca.gov.